This weekend we had some good friends from our cornfield days come visit. They were passing through, so our time was short, with little sleep. What I love most about these real friendships is the ability to pick up as if we saw each other a week ago, and go deep quickly. Our kids played Wii in the den as if they also had just seen each other last week, not 18 months ago, and we mama’s unpacked life quickly over pizza that had been packed away in foil and unpacked again, a few hidden chocolate covered almonds and our favorite granola bars. I have discovered over the years, when you have friends who walk through life intentionally with you, food often becomes a part of your times together. Tears over coffee, dinners celebrating babies born, bbq’s in the slow summer weeknights, picnicking with kids at the park…these are the memories I treasure from our 10 years in the Midwest cornfields. It is because my sweet friend has walked a path of an intentional relationship with me that she knows my likes so well. It is also because of our friendship that I knew the bag of goodies brought along included more effort and thought than the naked eye might realize. The cornfields, although limiting, have some fairly special local businesses. First, there is the pizza place where they have the most amazing creamy Italian salad dressing I’ve ever tasted. When we first moved to the cornfields, this restaurant closed in the summers while the owner went back to Italy. Those were some long weeks as I eagerly anticipated the re-opening, which coincided with the start of football. There was more than one occasion pizza, and a salad was ordered from the field post game! The second business is owned and operated by an amazing baker. I cannot accurately describe the bagels created in the brick oven of this woman, but I can tell you that these bagels have become the standard by which all bagels are now measured. In an extra twist which seems only possible in Midwestern cornfields, those bagels are delivered piping hot to your door simply by sending an email the day before requesting some. The third business is one that was just beginning to take form when we were moving. I’ve seen via my friends on Facebook this daily grow and grow, becoming a favorite field trip and weekend destination. One thing that makes this dairy even more special to me is that a girlfriend from my women’s Bible study works there. I remember hearing about all the plans and ideas when they were just dreams. I was SO thrilled to finally taste fresh cheese curds from this family owned business! The final goody in my “Taste of the cornfields” bag was some homemade granola bars. These granola bars are not just any bars my friends. 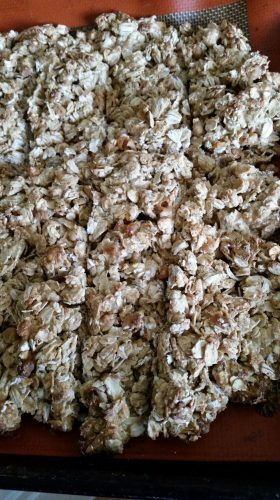 They are the result of the endless search for the best, inexpensive, easy, tasty granola bar. The bar that would be healthier than the store bought ones, but not so healthy as to require special ingredients be stored. These were the granola bars that accompanied us to Trivia Night where our team won, to the PB & J festival more than once, the snack staple our kids knew we were hiding when we wandered the zoo and many more places. Even though our guests have left, we will spend the next week enjoying our treasures. The effort it took to gather all of them, and mostly, appreciating the fact that distance hasn’t dampened my girlfriend’s memory on how to speak my love language. Intentionality in friendships is something not to squander. Our move to the mountains has allowed for some beautiful relationships for our family. Visits like this weekend are a blessed reminder that our tribe has not changed, it has only increased, and that is the best gift we could ever receive! Combine well, spread out evenly and bake 350 degrees for about 15 min. Until brown. *I have also added PB2 or vegan protein powders to up the protein. I yield 16 bars at lthan200 calories and around 10 grams of protein per bar in this version.